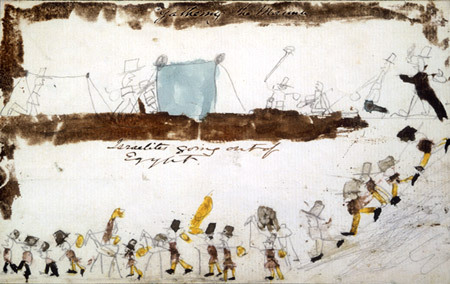 Drawing of the Israelites going out of Egypt. At the age of six, Robert Louis Stevenson composed and illustrated 'The History of Moses' for a family competition. It was dictated to his mother, but he drew a number of pencil sketches to accompany the text. He won a Bible picture book as a prize. His mother recorded in her diary that 'he was much pleased with it – from that time forward it was the desire of his heart to be an author'.